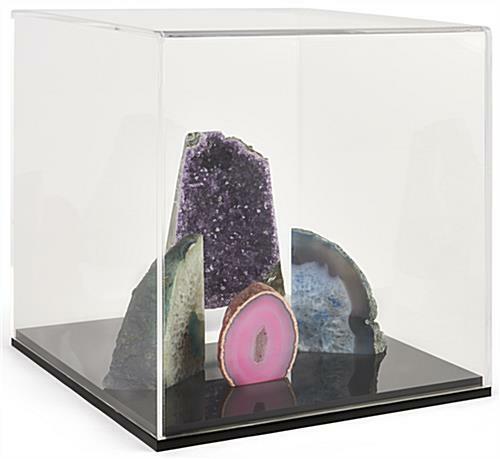 Acrylic riser included to hold round objects in place while on display. Lift-off top for easy access and removal of memorabilia items. 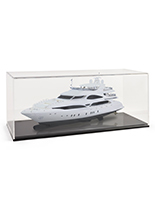 Clear acrylic top permits viewers to see the presented item from all sides. Black platform complements any countertop décor. Constructed from UV protection acrylic to prevent the content from fading. 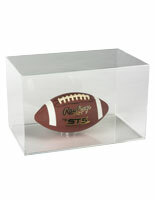 This plastic helmet display case features a simple design, enabling users to display a variety of collectibles! 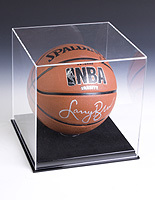 The spacious 14" x 14" x 14" interior provides users with plenty of room to showcase autographed footballs or basketballs, signed helmets, figurines, sculptures or trophies. 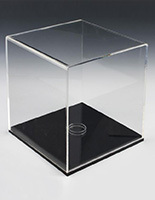 Constructed from UV protection acrylic, with a black base and a clear top, this helmet display case is affordably priced and prevent the content from discoloring and fading. The see-through casing permits easy viewing from every angles. 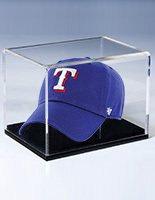 This acrylic cube, helmet display case that has a clear finish are sure to complement any décor. This item can be used in hobby stores to highlight new items or even a signed helmet. This countertop acrylic showcase, helmet display case can also be found in schools or residential areas displaying collectibles or awards. 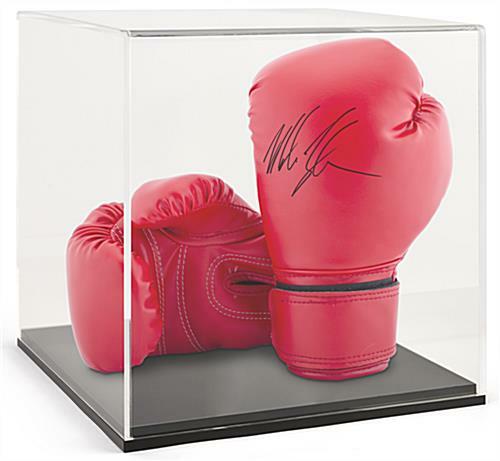 Each displayer can also be given as a gift to any sporting goods collector. This helmet display case that features a lift-off top, like helmet displayers, enable users to easily access the displayed items. This non-lockable countertop showcase is not meant for museum use. 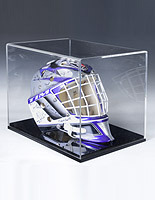 Each of this helmet display case includes a removable riser to hold round objects in place, such as a basketball or football. The ring can also be removed to exhibit any flat-base items. 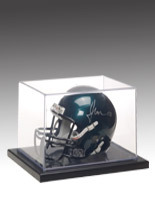 Your priceless collectibles will be protected from dust and other damaging elements in this helmet display case. 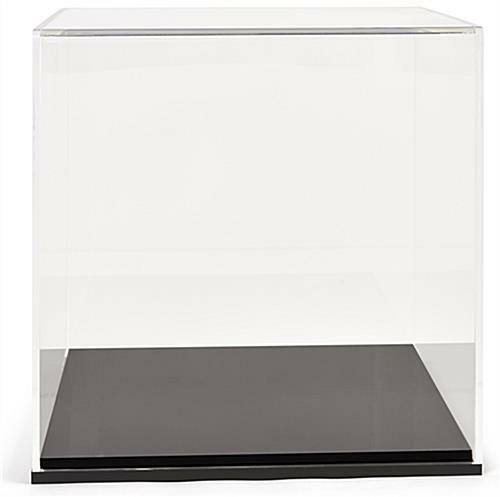 Acrylic showcase, like the ones seen here, is also available in other sizes as well. Purchase this countertop displayer today and use them to keep your collectibles in pristine condition! This is a beautiful, well-made display case. The base is heavy and sturdy so that the whole thing will stay put where you place it and protect the items inside. It's versatile, too, we actually turned it over and used the clear cube portion as a receptacle for raffle entries, without the base. My display case arrived expertly packed and was much heavier and more substantial than I expected. It is a great display case for a miniature 911 engine and has been a lovely addition to our den. The case was extraordinary quality and much nicer that the photos portray. The craftsmanship is amazing and I can't wait to get them in my stores. Wow your future son-in-law !! Bought for a birthday gift to put a very important collector stuffed bear in. Looked numerous stores and Noone had any ,so I turned to you and scored one beautiful display case. Posted 2 years ago by Richard T.
Thank you for the feedback, Pat!